Info George Corley Wallace Jr. (August 25, 1919 – September 13, 1998), was a United States politician who was elected Governor of Alabama as a Democrat four times (1962, 1970, 1974 and 1982) and ran for U.S. President four times, running as a Democrat in 1964, 1972, and 1976, and as the American Independent Party candidate in 1968. During the Civil Rights Movement in the 1960s, he rose to fame as a symbol of bigotry. Wallace was born in Clio in Barbour County in southeastern Alabama to George Corley Wallace and Mozell Smith. He became a regionally successful boxer in his high school days, then went directly to law school at the University of Alabama in Tuscaloosa in 1937. After receiving a law degree in 1942, he enlisted in the US Army Air Corps, flying combat missions over Japan during World War II. Wallace attained the rank of staff sergeant in the 58th Bomb Wing of the 20th Air Force Division. He served under General Curtis LeMay, who would be his running mate in the 1968 presidential race. While in the service, Wallace nearly died of spinal meningitis, but prompt medical attention saved him. He was left with partial hearing loss and nerve damage, and was medically discharged with a disability pension. In 1938, at age nineteen, Wallace contributed to his grandfather's successful campaign for probate judge. Late in 1945, he was appointed Assistant Attorney General of Alabama, and during May 1946, he won his first election as a member to the Alabama House of Representatives. At the time, he was considered a moderate on racial issues. As a delegate to the 1948 Democratic National Convention, he did not join the Southern walkout at the convention, despite his opposition to President Harry S. Truman's proposed civil rights program, which he considered an infringement on states' rights. The dissenting Democrats, known as Dixiecrats, supported then-Governor Strom Thurmond of South Carolina for the presidency. In his 1963 inauguration as governor, Wallace excused this action on political grounds. In 1953, he was elected judge in the Third Judicial Circuit Court. Here he became known as "the little fightin' judge," a reference to his boxing days. In 1958, he was defeated by John Patterson in Alabama's Democratic gubernatorial primary election, which at the time was the decisive election, the general election still almost always being a mere formality. This was a political crossroads for Wallace. Patterson ran with the support of the Ku Klux Klan, an organization Wallace had spoken against, while Wallace was endorsed by the NAACP. After the election, aide Seymore Trammell recalled Wallace saying, "Seymore, you know why I lost that governor's race?... I was outniggered by John Patterson. And I'll tell you here and now, I will never be outniggered again." In the wake of his defeat, Wallace adopted hard-line segregationism, and used this stand to court the white vote in the next gubernatorial election. "In the name of the greatest people that have ever trod this earth, I draw the line in the dust and toss the gauntlet before the feet of tyranny, and I say segregation now, segregation tomorrow, segregation forever." The lines were written by Wallace's new speechwriter, Asa Carter, a Klansman and longtime anti-Semite. On June 11, 1963 in an attempt to stop desegregation by the enrollment of two black students, Vivian Malone and James Hood, he stood in front of Foster Auditorium at the University of Alabama. This became known as the "Stand in the Schoolhouse Door." After being confronted by federal marshals, Deputy Attorney General Nicholas Katzenbach, and the Alabama National Guard, he stood aside. In September 1963, Wallace again attempted to stop four black students from enrolling in four separate elementary schools in Huntsville. After intervention by a federal court in Birmingham, the four children were allowed to enter on September 9, becoming the first to integrate a primary or secondary school in Alabama. The principal achievement of Gov. Wallace's first term was an innovation in Alabama development several other states later adopted: he was the first Southern governor to travel to corporate headquarters in Northern and Northeastern states to offer tax abatements and other incentives to companies willing to locate plants in Alabama. Numerous companies did so, notably shoe and textile manufacturers from the Northeast, and others such as Uniroyal, which located its first modern tire plant in Opelika, Alabama. Wallace initiated a junior college system that is now spread throughout the state, preparing many students to complete four-year degrees at Auburn University or the University of Alabama. Wallace disapproved vehemently of the desegregation of the state of Alabama and wanted desperately for his state to remain segregated. In his own words: "The President (Kennedy) wants us to surrender this state to Martin Luther King and his group of pro-Communists who have instituted these demonstrations." Using the segregationist image created by the University of Alabama controversy, he attempted to win national office in the 1964 presidential election. He ran on an "outsider" image, opposition to civil rights for blacks, message of states' rights, and "law and order" platform. In Democratic primaries in Wisconsin, Maryland and Indiana, he won a third of the vote in each. A restriction in Alabama's state constitution prevented Wallace from seeking a second term in 1966. Therefore, Wallace had his wife, Lurleen Wallace, run for the office as a surrogate candidate, similar to the 1917 run of Ma Ferguson for the governorship of Texas on behalf of her husband, who had been impeached and was barred from running. Mrs. Wallace won the election in the fall of 1966, and was inaugurated in January 1967. Lurleen Wallace died in office on May 7, 1968, during her husband's presidential campaign. She was succeeded by Lieutenant Governor Albert Brewer, reducing Wallace's influence until his new bid for election in his own right in 1970. However, largely due to the work of Wallace's supporters, the restriction was later repealed. Wallace ran for President in 1968 as the American Independent Party candidate. He hoped to force the House of Representatives to decide the election by receiving enough electoral votes, presumably giving him the role of a power broker. Wallace hoped that southern states could use their clout to end federal efforts at desegregation. His platform contained generous increases for beneficiaries of Social Security and Medicare. Nixon worried Wallace might steal enough votes to give the election to the Democratic candidate, Vice President Hubert Humphrey. Some Democrats feared Wallace's appeal to blue-collar workers and union members would hurt Humphrey in Northern states like Ohio, New Jersey, and Michigan. Wallace ran a "law and order" campaign similar to Nixon's. When Wallace pledged to run over any demonstrators who got in front of his limousine and asserted the four letter words hippies did not know were w-o-r-k and s-o-a-p, his rhetoric became infamous. He accused Humphrey and Nixon of wanting to radically desegregate the South. Wallace said, "There's not a dime's worth of difference between the Democrat and Republican Parties." His campaign was supported by the John Birch Society. While most of the media opposed Wallace, some southern newspapers enthusiastically backed him. 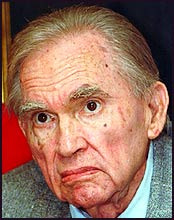 George W. Shannon (1914–1998) of the now defunct Shreveport Journal, wrote countless editorials supporting the third-party concept. Wallace repaid Shannon by appearing at Shannon's retirement dinner. While Wallace carried five Southern states and won almost ten million popular votes, Nixon received 31 electoral votes more than needed to win the election. Wallace remains the last non-Democrat, non-Republican candidate to win any electoral votes. He was the first person since Harry F. Byrd, an independent segregationist candidate in the 1960 presidential election. (John Hospers in 1972, Ronald Reagan in 1976, Lloyd Bentsen in 1988 and John Edwards in 2004 all received one electoral vote from dissenters, but none "won" these votes.) Wallace also received the vote of one North Carolina elector who was pledged to Nixon. Many found Wallace an entertaining campaigner. To hippies who called him a Nazi, he replied, "I was killing fascists when you punks were in diapers." Another quote: "They're building a bridge over the Potomac for all the white liberals fleeing to Virginia." Although he agreed with Abraham Lincoln black equality can come with education, uplift, and time, he disagreed blacks should be able to vote, serve on juries, or hold public office. In 1970, Wallace faced incumbent Governor Albert Brewer, who was the first gubernatorial candidate since Reconstruction to openly court black voters. Brewer unveiled a progressive platform and worked to build an alliance between blacks and the white working class. He said of Wallace's out of state trips, "Alabama needs a full-time governor." To weaken the prospects of a presidential campaign in 1972, President Nixon backed Brewer and arranged an Internal Revenue Service investigation in the Wallace campaign. In the primary, Brewer got the most votes but failed to win an outright majority, triggering a run-off election. The Wallace campaign aired TV ads with slogans such as "Do you want the black block electing your governor?" and circulated an ad showing a white girl surrounded by seven black boys, with the slogan "Wake Up Alabama! Blacks vow to take over Alabama." Wallace called Brewer a sissy and promised not to run for president a third time. Wallace defeated Brewer in the runoff. The day after the election, he flew to Wisconsin to campaign for the White House. Wallace, whose presidential ambitions would have been destroyed by a defeat, ran "one of the nastiest campaigns in state history," using racist rhetoric while proposing few ideas of his own. A Gallup Poll shows Wallace was the seventh most admired man in America, just ahead of Pope Paul VI. In early 1972, he declared himself a candidate, entering the field with George McGovern, 1968 nominee Hubert Humphrey, and nine other Democratic opponents. In Florida's primary, Wallace carried every county to win 42 percent of the vote. When running, Wallace claimed he was no longer for segregation, and had always been a moderate. Wallace was shot five times by Arthur Bremer while campaigning in Laurel, Maryland, on May 15, 1972. As one of the bullets lodged in Wallace's spinal column, the shooting left him paralyzed. Three others wounded in the shooting survived. Bremer's diary, An Assassin's Diary, published after his arrest shows the assassination attempt was motivated by a desire of fame, and President Nixon had been a possible target. Following the shooting, Wallace won primaries in Maryland, Michigan, Tennessee, and North Carolina. From his wheelchair, Wallace spoke at the Democratic National Convention in Miami on July 11, 1972. The Democratic nominee, South Dakota Senator George McGovern, was later defeated by President Nixon who carried 49 of the 50 states, losing only in Massachusetts. Since Wallace was out of Alabama for more than twenty days when he was recovering in Holy Cross Hospital in Silver Spring, Maryland, the state constitution required the lieutenant governor Jere Beasley to serve as acting governor from June 5 until Wallace's return to Alabama on July 7. Wallace never returned to Maryland. Bremer was sentenced to fifty-three years in prison. He served thirty-five years and was released on parole on November 9, 2007. In November 1975, Wallace announced his bid. The campaign was plagued by voters' concerns with his health, as well as the media's constant use of images of his apparent "helplessness." His supporters complained such coverage was motivated by bias, citing the discretion used in coverage three decades earlier, or lack of coverage, of Franklin D. Roosevelt's paralysis before television became commercially available. Jimmy Carter won the nomination. Calculating all the southern primaries and caucuses, Wallace only carried Mississippi, South Carolina and his home state of Alabama. Calculating the popular votes in all primaries and caucuses, Wallace placed third behind Jimmy Carter and California Governor Jerry Brown. After all the primaries ended losing several Southern primaries to former Georgia governor Jimmy Carter, Wallace dropped out in June 1976. He eventually endorsed Carter, later claiming he facilitated a Southerner's nomination. Wallace became a born-again Christian in the late 1970s and apologized for his earlier segregationist views to black civil rights leaders. He said while he once sought power and glory, he realized he needed to seek love and forgiveness. His term as Governor (1983–1987) saw a record number of black appointments to government positions. In the 1982 Alabama gubernatorial Democratic primary, Wallace's main opponents were Lieutenant Governor George McMillian and Alabama House Speaker Joe McCorquodale. In the primary, McCorquodale was eliminated, and the vote went to a runoff with Wallace holding a slight edge over McMillian. Wallace won the Democratic nomination by a margin of 51 to 49 percent. In the general election, his opponent was Montgomery Republican mayor Emory Folmar. Most polling experts said this was the best chance since Reconstruction for a Republican to be elected Alabama governor. However, Wallace easily won the general election, with a margin of 62 to 39 percent. Counting Lurleen Wallace's term as his surrogate, George Wallace achieved five gubernatorial terms across three decades, totaling seventeen years in office (it would have been twenty had Lurleen served four years instead of 17 months). This record is approached by the 15 year tenure of Governor Nelson A. Rockefeller in New York, the 14-year tenure (in consecutive terms) of Governor James R. Thompson of Illinois and Governor Tommy Thompson of Wisconsin, as well as the 16-year tenures attained by Governors Terry E. Branstad of Iowa (in consecutive terms), and Governors James A. Rhodes of Ohio, Edwin Washington Edwards of Louisiana, William Milliken of Michigan, and Jim Hunt of North Carolina (in non-consecutive terms). At a Montgomery restaurant a few blocks from the State Capitol, Wallace became something of a fixture. In constant pain, he was surrounded by an entourage of old friends and visiting well-wishers and continued this ritual until a few weeks before his death. Wallace was the subject of a documentary, George Wallace: Settin' the Woods on Fire, shown by PBS on the American Experience in 2000. On one occasion, when asked by a reporter which contemporary American political figure he most admired, he paused thoughtfully for a moment, smiled, and said: "Myself." A black lawyer recalls, "Judge George Wallace was the most liberal judge that I had ever practiced law in front of. He was the first judge in Alabama to call me 'Mister' in a courtroom." Later, when a supporter asked why he started using racist messages, Wallace replied, "You know, I tried to talk about good roads and good schools and all these things that have been part of my career, and nobody listened. And then I began talking about niggers, and they stomped the floor." Wallace died of septic shock from a bacterial infection in Jackson Hospital in Montgomery on September 13, 1998. He suffered from Parkinson's disease and respiratory problems in addition to complications from his gun-shot spinal injury. The Interstate 10 tunnel which traverses the Mobile River is named in his honor. US President - D Convention - Aug 17, 1956 D George Bell Timmerman, Jr.